Over the new year’s holiday we were in Hong Kong, in part to take part in the second annual Xanga meet-up or, more accurately, the Xanga alumni meet-up. This year’s group was roughly the same as last year’s and once again a nice venue was chosen for dinner: Island Tang. Island Tang’s owner is Sir David Tang (of the Shanghai Tang retail brand) whose restaurants include China Club, which I wrote about two days ago. 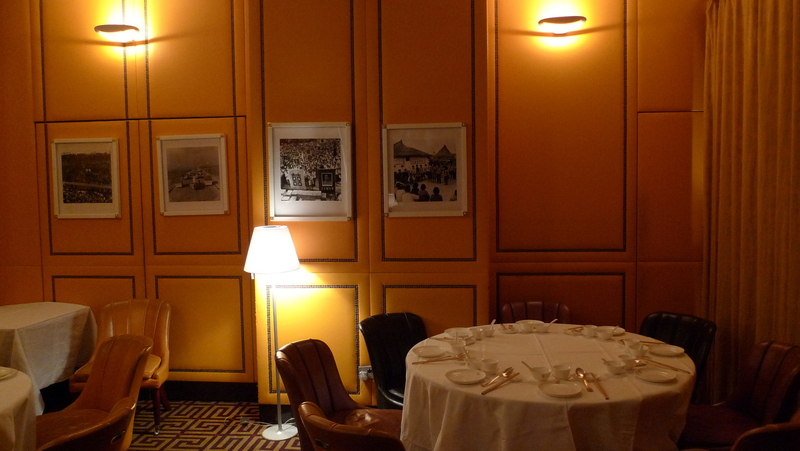 The interior of the restaurant is every bit as elegant as China Club but many degrees subtler. 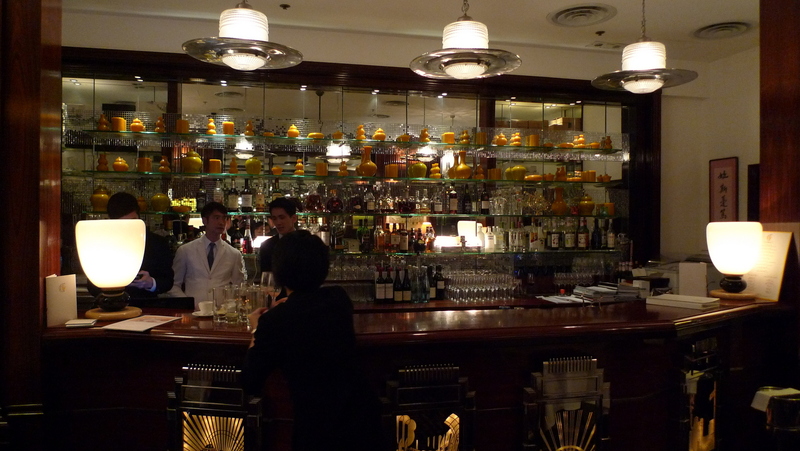 As Time Out Hong Kong described it, Island Tang is Hong Kong of the 1940s compared to China Club’s Shanghai of the 1920s. In fact, it isn’t too much to describe the space as gorgeous. There was tremendous attention to detail in everything from decor to menu design to place settings. It felt elegant from the very start. 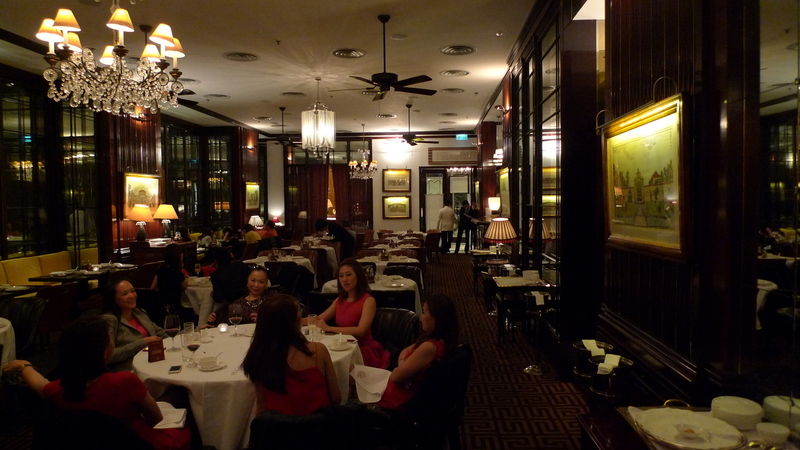 The menu is primarily Cantonese food. The pictures here are a selection of what we ordered, although not everything. 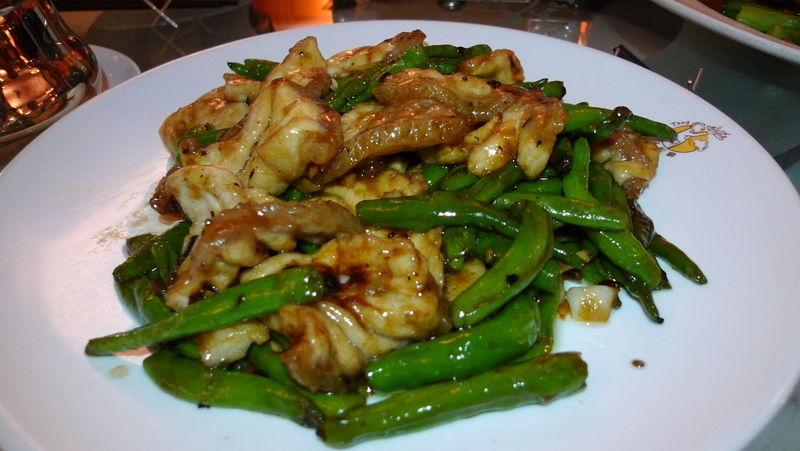 Above is the wok-fried jumbo garoupa fillets with Hangzhou pepper, garlic, and preserved black beans. Tasty dish although the fish was a bit overwhelmed by all the other flavors. 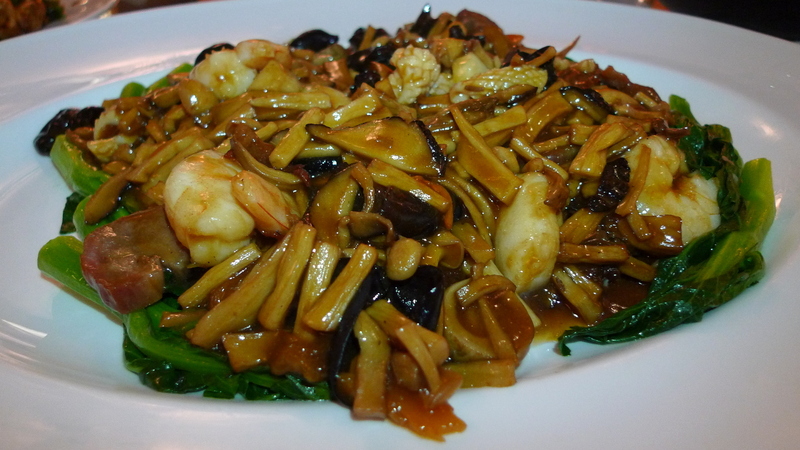 A traditional braised duck with “eight treasures” – additional ingredients which can vary by recipe but in this case included shrimp, scallops, and mushrooms among other things. Very tasty dish. 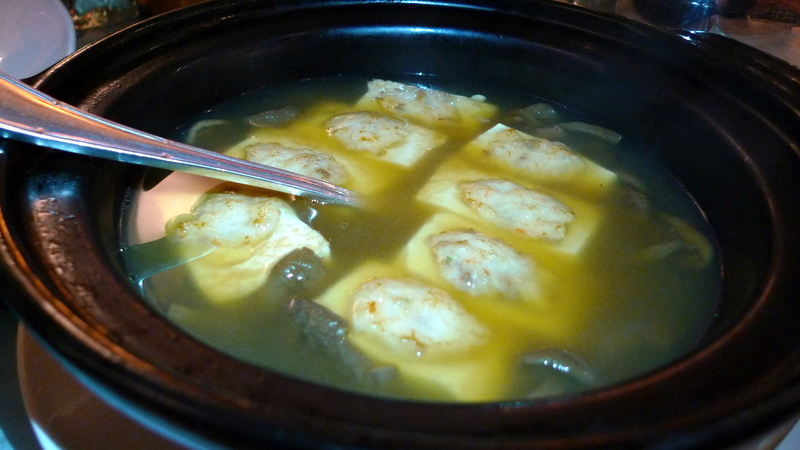 We tried several different soups, most of which were similar to what I showed from China Club. One unique offering was a casserole boiled bean curd (tofu) stuffed with minced pork and mushroom. This was a very nice, subtle dish. 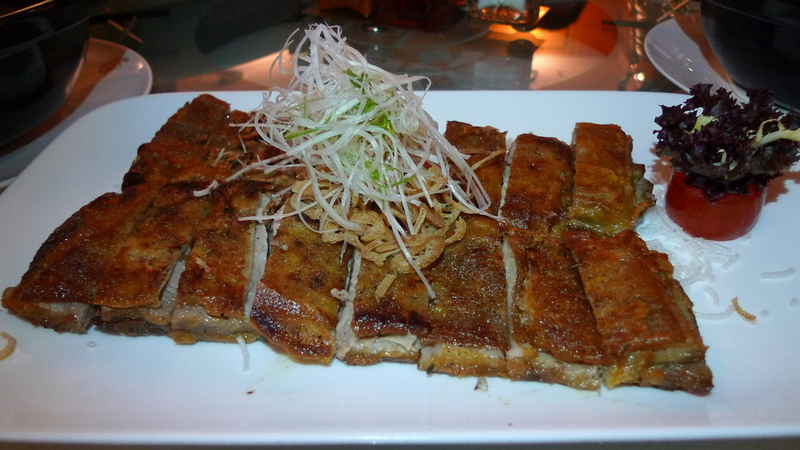 One of the non-Cantonese dishes, a very tasty pan-fried Welsh lamb belly seasons with cumin. The skin was crispy, the fat was properly rendered, and the cumin gave it an earthy flavor that was delightful. 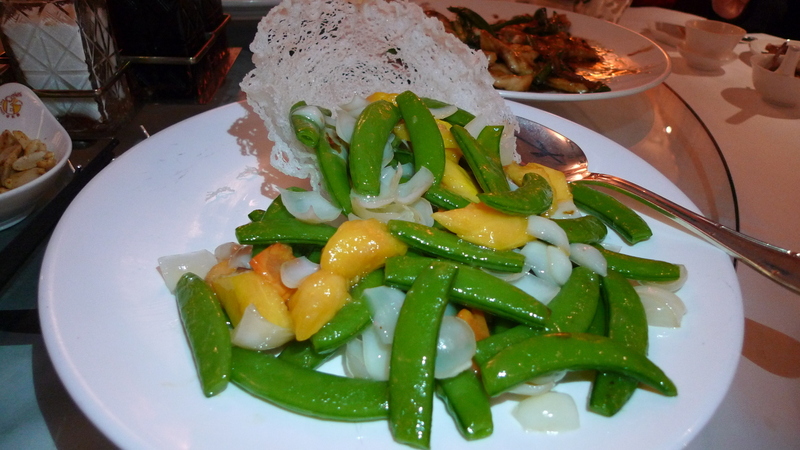 Quite an interesting dish was the wok-fried papaya with honey bean and fresh lily bulb. Most of the time in Thai cooking, we use green papaya, so I was caught a bit off guard to find ripe papaya used in this stir-fry. The most interesting ingredient was the lily bulb, something I don’t think I’ve had before. The combination was light and flavorful. 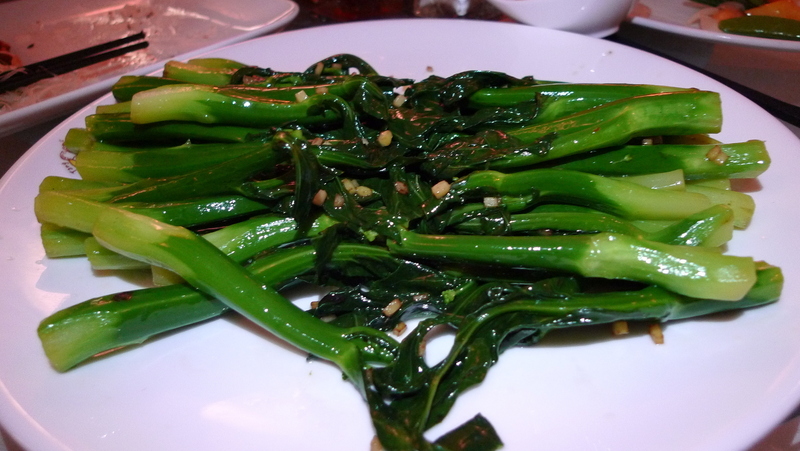 For some more vegetables, we had wok-fried kale with crushed ginger and rice wine. A simple dish, well executed. We ordered a variety of chilled, pudding-like deserts that were tasty but did not photograph well. 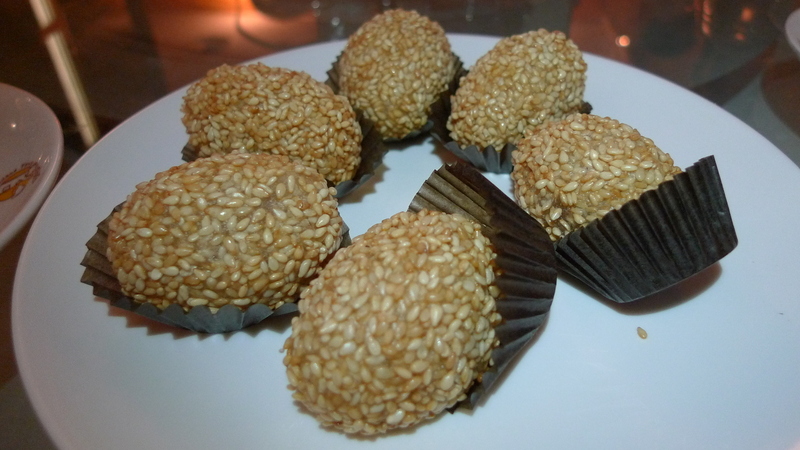 The only item I did photograph were these glutinous rice and sesame balls, which thankfully weren’t as oily as I had expected. A final shot of the dining room. We started eating at 8:30 and by the time we left, were pretty much the last diners. These ladies left before us. 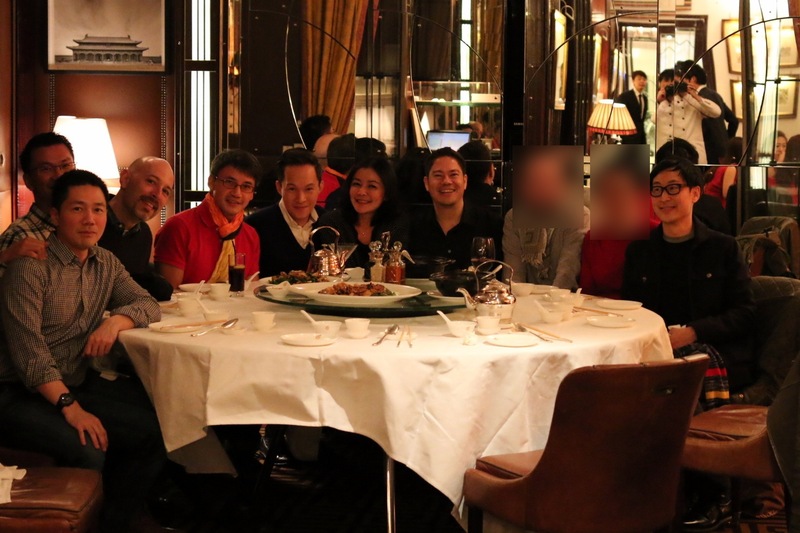 The obligatory shot of the current and former Xangans plus four non-blogger guests. Will let you figure out who is who. This entry was posted in Food, Uncategorized and tagged Cantonese, cuisine, Dining, Dinner, hong kong, Island Tang, Meetup, xanga by christao408. Bookmark the permalink. The lamb belly was great, wasn’t it? I was very happy we could repeat this meeting … two years in a row. Are we starting a tradition? I’m all for it. 2014 – mark your calendar. I can see your face in one of the mirrors. Just kidding. I actually double-checked the reflections just for that. Very cool photos of everyone and the food looks yummy. This place looks like it’ll be good for drinks, just seems to have that vibe. Really nice to see some Xangans together. I hope you guys spent more time together outside of this dinner. Unfortunately, due to everyone’s schedules we were only able to see Nick and Yun once more and nobody else. May need to try and plan a bit more carefully next time. I’m trying to figure out who Yun is. I don’t remember that name from Xanga. He wasn’t a Xangan. Partner of a Xangan. The food looks good (especially the lamb) and I hope to join you guys one of these days. Mark your calendar for year’s end 2014, if you want. I know it will be an anniversary for you but maybe still a time you’d like to spend abroad. We’ll see. I still have relatives in HKG although I don’t really stay in touch with them as much as I want to.